Manufacturer & Exporter of Geo Jute. Our product range also comprises of Jute Sacking Bags, Hessian Bags and Sand Bags. Privi exports offers premium quality Geo Jute at most nominal market prices. This is commonly used as a biodegradable surface stabiliser and soil improvement. Geo Jute are used in Highway, Housing and Airport Projects also. We are known manufacturer and exporter of Jute Soil Saver. These are used for preventing top soil erosion and soil improvement. 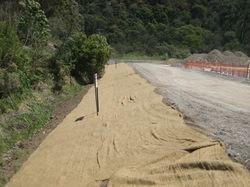 Our Jute Soil Saver and Geo Jute are used in Highway, Railway, Housing, Airport Projects also.